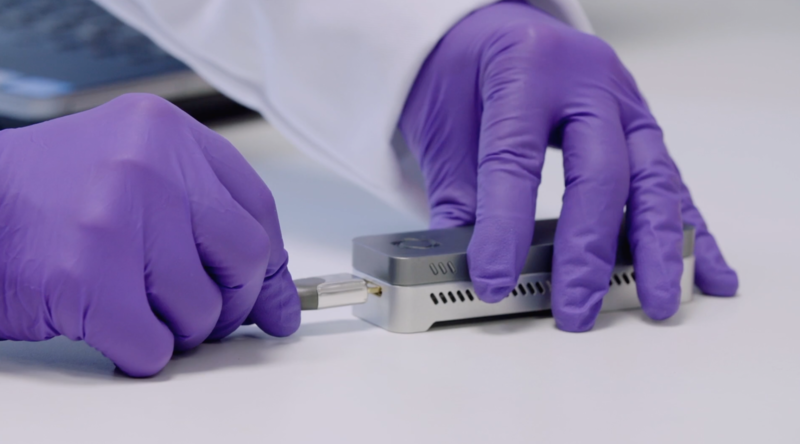 Over the last few months, Oxford Nanopore (ON) instruments have been used to achieve two major sequencing milestones. First, in December, a group in Australia announced they had become the first to generate a DNA read longer than 1 Mb when they produced a 1.105 Mb read from Chromosome 19. Then, just last week, a paper was published in Nature Biotechnology describing how scientists used a handheld ON sequencer – the MinION – to assemble an entire human genome by direct long reads. That accomplishment is another important first that demonstrates how this technology can power breakthroughs. To learn more about this remarkable study and the Nanopore technology, see this post on the WuXi NextCODE Genomic Insights blog. It features comments and insights from our esteemed colleague Dr. Hongye Sun, our Chief Technology Officer and head of our sequencing lab in Shanghai. WuXi NextCODE has a lot of experience working with Nanopore instruments. In October of last year, we announced that our Shanghai sequencing laboratory would feature the first open-access installation of ON instruments in a laboratory in China. 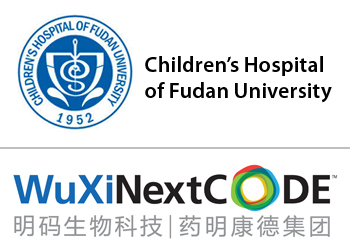 The first year of WuXi NextCODE’s partnership with Fudan Children’s Hospital has delivered 11,000 clinical reports and a diagnosis rate of 33%, matching the throughput and success rate of the world’s leading laboratories. One year ago, WuXi NextCODE (WXNC) and the Children’s Hospital of Fudan University (CHFU) launched a joint laboratory to put the global gold standard in sequence-based rare disease diagnostics at the service of patients in China. In the first year of that joint effort, the partnership delivered some 11,000 clinical reports—with more than 1,000 new reports now being generated each month—and a diagnosis rate of 33%. This matches the throughput and success rate of the leading laboratories in the world. Dr Lin Yang of CHFU presented a summary of this remarkable progress at WXNC’s breakfast session on rare disease at the ASHG17 meeting held recently in Orlando. Afterwards, WXNC’s global communications lead, Edward Farmer, sat down to talk about this collaboration and what it means for patients, with Associate Professor and Laboratory Director Dr. Huijin Wang from the clinical team; Dr. Bing Bing Wu, director of the medical diagnostics laboratory; and Assistant Professor Dr Xinran Dong, who leads the bioinformatics team, as well as WXNC Chief Scientific Officer, Jeff Gulcher. Edward Farmer: It’s a real pleasure to have with us our colleagues from Fudan and to be able to hear about this collaboration in rare disease diagnostics and genome-based testing in the neonatal unit. To start us off, Jeff, can you tell us how this partnership came about and how you see its importance to rare disease diagnostics in China and worldwide? Jeff Gulcher: It’s been a fantastic partnership that started about two-and-a-half years ago, when we began discussing the possibility of creating a joint laboratory. The aim was to take advantage of WXNC’s technology and sequencing expertise together with Fudan’s expertise, both on the medical side and the interpretation side. The goal was to enable whole exome or medical exome sequencing of very sick children. In parallel, we decided to see if sequencing is useful in the neonatal ICU setting. Through this partnership, we’ve now sequenced a large number of children and worked together to make diagnoses. Our medical genetics teams have worked closely together to interpret these cases, and in about one-third of the cases, we’ve been able to deliver diagnoses that were not suspected by the treating physician. In many cases, that has led to different treatments, with better outcomes for the children. Together, we have now sequenced over 11,000 pediatric cases, including some 2,500 neonatal ICU cases, and we are very pleased with this partnership. Edward Farmer: We have with us several senior people from Fudan. Huijin, let’s begin with you, as director of our joint laboratory. Can you share with us your impressions of this partnership so far and some of your results? Huijin Wang: We have had a very good experience with this collaboration. We have many cases and, each week, we have a case meeting with the Cambridge WXNC team and we discuss the data and variant curation for the more difficult ones. The results have been impactful for the patients. In many cases, we can deliver a clinical diagnosis, and some of these offer real treatment options. I remember one case that first came to the neurological clinic with seizures and hypoglycemia. This child had presented with recurrent hypoglycemia at a very early age and was in the NICU. We sequenced the family and found a recessive variant in the FBP1 gene, which the patient had inherited from both parents. After this diagnosis, the doctor was able to discuss the problem with the family and advise them on how to limit the child’s diet to avoid hypoglycemia. The child is now doing well and no longer experiencing hypoglycemic episodes. And his family came back later and planned to have another child, and we referred them for prenatal diagnosis, and they were able to have another child who is healthy. This was a very successful case and is the sort of story that encourages us and shows us the value of the work we are doing. Edward Farmer: That is an encouraging result. Lin, as an attending physician, how do you see the impact of introducing this technology into China at scale? Lin Yang: We have more and more children at our hospital with birth defects or congenital malformations, so we really want to get a diagnosis and whatever possible treatment for them, including new treatments when available. The collaboration between our hospital and WXNC starts with us deciding whether the case is likely to be the result of a genetic disorder. If it is, we do pre-testing counseling for the whole family before taking DNA samples. We then use WXNC’s capabilities for the sequencing and analysis of the results. Finally, we need to interpret the sequencing results and report them to the parents. It is often very difficult for parents to understand “what is a gene,” “what is a mutation,” “what is the disorder,” and “how can your child benefit from a molecular diagnosis?” So that is a critical part of our work. But more and more patients are choosing molecular diagnosis and, if they get a correct diagnosis early, they may find a useful and more targeted treatment earlier. In the NICU, we have some patients that have immune deficiency disorders. These can be very serious conditions, as the children suffer from repeated infections. It is very hard on the whole family. For such cases, if you have a specific diagnosis, there is often a cure. This is very good news for these families in the NICU, as they now have the possibility of getting a molecular diagnosis and then a treatment. Edward Farmer: Are there any specific examples or cases that you can share with us? Lin Yang: I had a newborn patient who had very low platelet counts and petachiae (red spots from small bleeds) on his face and body. We found that he has a mutation in the WAS gene, inherited from his mother’s side of the family, which means that his bone marrow is not producing enough platelets. But with a hematopoietic cell transplantation [HCT, which can include bone marrow] from a relative or closely matched donor, he has every chance of being cured of the disease and becoming a healthy boy. He is now waiting for a matched donor. Edward Farmer: Huijin, you’ve done amazing work so far, and I know you are only getting started, but I wonder what proportion of the patients you see are able to benefit from the work of your lab and the collaboration with WXNC? Huijin Wang: Currently, we are delivering a diagnosis to about 30% of patients, and we are able to recommend specific clinical treatment for about 20% of our patients. And very often, we can give some guidance, if not a cure. Sometimes just knowing exactly what the diagnosis is gives patients peace of mind and new options. For example, many can go to a specialty clinic. But just knowing the diagnosis is often a comfort. There is also a big need, and as a national center of excellence our diagnostics can help people across the country. About 80% of our patients come from outside of Shanghai, so with a diagnosis, they can go back to where they live and take some action there. Lin Yang: There is also a difference among different diseases. I think we are now able to provide actionable results to about 50% of patients with neuromuscular disorders, and for respiratory maybe something less than that. For NICU, it’s maybe 15% that get a diagnosis, but we want to boost all of these. We can benefit many more patients with this technology. In our hospital and with the WXNC collaboration, we can see an increasing number of patients. But there are a lot of undiagnosed patients, and in many places, there is not yet access to molecular diagnostics, so we hope this capability spreads to other parts of the country as well. Edward Farmer: And Xinran, as we’re talking about building the scale and reach of molecular diagnostics, perhaps you can tell us a bit about how you are dealing with all of this data. Xinran Dong: We have collected a lot of data. And from my bioinformatics perspective, one of the things that the WXNC collaboration is helping us to do is to make good use of the data, both for our clinical cases and for research. I see part of my job as helping to build this into one of the biggest databases on rare disease in China and maybe the world. This is going to help patients today and advance the discovery of new genes. Edward Farmer: Clearly there is no lack of ambition here. I want to thank you all for your time, and we look forward to sharing more stories of our work together. Gene sequencing for breast cancer. More than the usual suspects at play. This intriguing study raises a crucial question: How much sequencing is enough when diagnosing breast cancer in the age of targeted therapies? The number of these therapies keeps growing, as does our knowledge of the links between what drugs work for women with particular mutations. But at what point should we say we have uncovered enough mutations to make a proper diagnosis? And in a field in which we know there’s a lot we don’t know, is there such a thing as enough? The good thing is that sequencing costs are going down. “It used to be that just testing for a single gene cost several thousand dollars,” says Jim Lund, Director of Tumor Product Development at WuXi NextCODE. “Now a panel of genes costs that and whole exome sequencing is slightly more.” At the same time, the number of mutations that are discovered and studied is increasing – in the genomes of patients and the genomes of their tumors. The data here has a message about data itself: in principle, we should be generating as much sequencing data as possible. By generating it, storing it for vast numbers of patients and their healthy relatives, creating more comprehensive databases of all disease-linked variants, and then reanalyzing patient and tumor samples as more is learned, we can improve the risk assessment and the speed and accuracy of diagnosis for patients everywhere. Since we can do this, the question isn’t whether we can afford to do more sequencing, but why anyone would argue that we can afford not to. The researchers who led the recent JAMA study used multiplex genomic sequencing on breast tumor samples from 1007 patients. They tested for a total of 23 known and candidate genes. It has been well documented that women of Ashkenazi descent have a higher risk of breast and ovarian cancer, and that is at least in part because of three particular BRCA1 and BRCA2 mutations. These are called founder mutations, because they probably originated among some of the earliest members of this ethnic group, and have been propagated because of a strong history of marriage within the same community. But the researchers working on this study wanted to know if there were mutations in other genes besides BRCA that made it more likely these particular women would develop breast cancer. The patients were from 12 major cancer centers; had a first diagnosis of invasive breast cancer; self-identified as having Ashkenazi Jewish ancestry; and had all participated in the New York Breast Cancer Study (NYBCS). Surprisingly, only 104 of the patients were carrying one of the infamous founder alleles. Seven patients had non-founder mutations in BRCA1 or BRCA2, and 31 had mutations in other genes linked to increased risk of breast cancer, including CHEK2. The vast majority of these women carried none of the mutations that are “obvious suspects” for breast cancer. “We do not know why those women got breast cancer,” says Shannon T. Bailey, Associate Director of Cancer Genetics at WuXi NextCODE. It’s important to note that thousands of different cancer-predisposing mutations have been found in BRCA1 and BRCA2 alone. Every population studied to date includes people with such mutations. The three founder mutations that have been established as being common among Ashkenazis are estimated to account for about 10% of breast cancers in this group. The rest of BRCA1 and BRCA2 mutations are considered extremely rare under any circumstances. “If you look at the genes on the panel used in this study, it looks as if they are mostly associated with DNA damage and there are no cell cycle regulating genes included,” says Bailey. “But there are all kinds of mutations that cause breast cancer, even in noncoding regulatory zones.” As a result, even the best designed panel may fall short. That’s why this study is so important. It tells us that even with founder mutations, family history matters but it doesn’t yet always tell you everything you’d like to know. Of the women with the founder BRCA mutations, only about half had a mother or sister with breast or ovarian cancer. It’s also already well known that just carrying a BRCA1 or BRCA2 mutation is no guarantee the patient will get cancer. For reasons we don’t yet understand, these mutations raise overall risk, but not everyone who carries one will develop the disease. So while BRCA mutations are important, we need lots more information about other genes too. 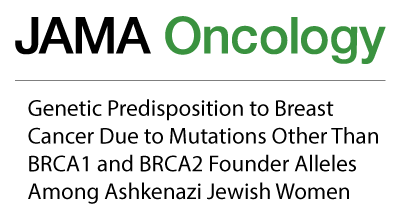 The authors of this JAMA report suggest that Ashkenazi patients with breast cancers should have “comprehensive sequencing,” including, perhaps, complete sequencing of BRCA1 and BRCA2 and possibly testing for other breast cancer genes as well. And what about other patients? WuXi NextCODE’s Lund points out that even the most highly regarded recommendations for breast cancer testing do not cite specific panels. Those recommendations come from the U.S. Government Task Force [https://www.uspreventiveservicestaskforce.org/Page/Document/RecommendationStatementFinal/brca-related-cancer-risk-assessment-genetic-counseling-and-genetic-testing] and the NCCN Clinical Practice Guidelines. Women with a family history will likely get more comprehensive testing, but beyond that it is not clear exactly how to proceed in every case. At WuXi NextCODE we believe that this is clear evidence pointing to the value of doing more sequencing across all ethnic groups – for healthy individuals, patients, and their tumors, and pushing towards sequencing as standard of care. This would expand our knowledge of the genetic risk factors for breast and other cancers; provide vast new cohorts for research; and deliver the most actionable insights to patients, from risk assessment through diagnosis and then ongoing as new discoveries are made. All of the participants in this JAMA study consented to have their sequence data used to advance research. They are already helping to do that, and this is just one study of thousands that are now underway and that are helping us to expand our data- and knowledgebases with the ultimate aim of delivering even better outcomes for all people and patients everywhere. Whatever path various societies take to tap the power of the genome to improve human health, a recent report from England’s Chief Medical Officer, Dame Sally Davies, calls out key elements for realizing that future sooner rather than later. England’s Chief Medical Officer wants to build on the success of Genomics England’s 100,000 Genomes Project and take her country swiftly into the age of precision medicine. The goal is to get patients optimal treatment more quickly and with fewer side effects. That means using genomics to more accurately guide prescribing—initially for cancer, infections, and rare diseases—but increasingly for all conditions and overall wellness and prevention. 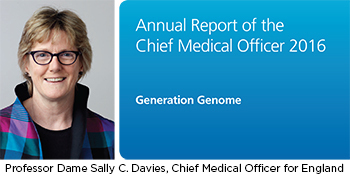 Dame Sally Davies’ vision is anchored in the work that Genomics England is engaged in today and to which WuXi NextCODE and other leading genomics organizations have contributed. It’s a rallying cry that many voices are joining and underpins our work not only in England, but also similar efforts we are helping to advance in countries near and far, from Ireland to Singapore. Industrial scale: Genomics has in many ways been treated and developed as a “cottage industry,” yielding important advances. But the need is massive scale in the era of population health (e.g., whole-genome sequencing, or WGS). Privacy AND data sharing: Dame Sally wants to provide and ensure high standards of privacy protection for genomic data but is adamant that this should not come at the price of stifling the data sharing and large-scale collaboration that will transform medical care and many patients’ lives. She wants to move beyond “genetic exceptionalism,” which holds that genomic data is fundamentally different or more valuable than other data. Like other sensitive data, we can protect genomic data well and use it for public benefit. Public engagement: She calls for a new “social contract” in which we, as individuals and members of society, recognize that all of us will benefit if we allow data about our genomes to be studied. That holds whether we are talking within our own countries or globally. To date, more than 30,000 people have had their genomes sequenced as part of the 100,000 Genomes Project. But there are 55 million people in the UK, and Dame Sally would like to see genomic testing become as normal as blood tests and biopsies for cancer patients: She wants to “democratize” genomic medicine, making it available to every patient that needs it. We share and are, indeed, taking part in helping to realize much of Dame Sally’s vision as we work to accelerate Genomics England’s work and engage with our partners globally. As we know, different societies have different models of healthcare and different approaches to research and care delivery. But the ability for people anywhere to tap into the power of the genome to improve their health is at the very core of our own mission as an organization, and we applaud Dame Sally for calling out some of the key elements for realizing that future sooner rather than later. Whatever path different societies choose to follow toward precision medicine, her recent report provides one enlightening view of a starting point for making the leap. As massive cancer databases like The Cancer Genome Atlas (TCGA) proliferate and expand worldwide, WuXi NextCODE expects to see—and to drive—a boom in discoveries of cancer biomarkers that will advance our ability to treat cancer and improve outcomes for patients. One of the fastest-growing areas in medicine today is the creation of massive cancer databases. Their aim is to provide the scale of data required to unravel the complexity and heterogeneity of cancer—the key to getting patients more precise diagnoses faster, and to getting them the best treatments for their particular disease. In short, this data has the potential to save lives. Such databases are not new, but they are now proliferating and expanding at an unprecedented pace. Driven by governments, hospitals, and pharmaceutical companies, they catalogue a growing range of genetic data and biomarkers together with clinical information about their effects on disease, therapy, and outcomes. Only with such data can we answer the key questions: Does a certain marker suggest that a cancer will be especially aggressive? Does it signal that the tumor responds best to particular treatments? Are there new pathways involved in particular cancers that we can target to develop new drugs? It’s the cutting edge of oncology, but to be powered to answer these questions, these databases have to be very, very big. They have to bring together whole-genome sequence data on patients and their tumors as well as a host of other ‘omics and biological data. One of the biggest challenges to realizing this potential is to manage and analyze datasets of that scale around the world. It’s one we are addressing in a unique manner through our global platform. One of the most renowned and widely used of these is The Cancer Genome Atlas, a collaboration between the National Cancer Institute (NCI) and National Human Genome Research Institute (NHGRI). TCGA data is freely available to those who qualify, and there is a lot of it. It already comprises 2.5 petabytes of data describing tumor tissue and matched normal tissues for 33 tumor types from more than 11,000 patients. Researchers all over the world can apply to use this data for their own studies, and many have. Yet asking questions of TCGA alone can take months for most groups and requires sophisticated tools. At Boston’s recent Bio-IT World conference, WuXi NextCODE’s director of tumor product development, Jim Lund, explained how we have put TCGA on our global platform—providing a turnkey solution with integrated analytics to transform the data into valuable findings. Jim and his team have imported into WuXi NextCODE’s cloud platform virtually all key TCGA data: raw whole exome sequence data from patients and tumors, as well as variant calls using MuTect2 and Varscan2; RNA and microRNA sequence and expression data; and data on copy number variation, methylation arrays, and some 150 different clinical attributes. But this data isn’t just hosted in the cloud: it can all now be queried directly and at high speed online, enabling researchers to quickly ask and answer highly complex questions without having to download any data or provide their own bioinformatics software. To demonstrate the power of this approach, Jim’s team decided to run the same queries in a recent published study that looked at sequence data from the exons of 173 genes in 2,433 primary breast tumors (Pereira et al., Nature 2016). They were specifically looking for driver mutations of cancer’s spread and growth. In a matter of minutes, rather than months, they were able to replicate key mutations identified in the study. That analysis was then extended to all cancer genes, and additional driver genes were found. More important, because they were able to correlate these mutations with clinical outcomes data, they were also able to begin systematically matching specific mutation patterns to patient outcomes. Next, Jim’s team looked at the genomics of lung adenocarcinoma, the leading cause of death from cancer worldwide. Following up on the findings in another published study (Collison et al., Nature 2014), they profiled the 230 samples examined in the paper and immediately made several observations. Eighteen genes were mutated in a significant number of samples; EGFR mutations (which are well known) were more common in samples from women; and RBM10 mutations were more common in samples from men. These results were extended to 613 samples and shown to be robust. But because they had a wide range of data including mRNA, microRNA, DNA sequencing, and methylation, Jim’s team was further able to suggest some actual biological processes that may be fueling the origin and growth of lung adenocarcinomas. What’s making this type of research possible? It’s our global platform for genomic data. The platform spans everything required to make the genome useful for helping patients around the world, from CLIA/CAP sequencing to the world’s most widely used system for organizing, mining, and sharing large genomic datasets. At its heart is our database—the Genomically Ordered Relational database (GORdb). Because it references sequence data according to its position on the genome, it makes queries of tens of thousands of samples computationally efficient, enabling the fast, online mining of vast datasets stored in multiple locations. That’s how we are making the TCGA—and every major reference dataset in the world—available and directly minable by any researcher using our platform. Those users can combine all that data with their own to conduct original research at massive scale. These breast and lung cancer studies are just two of more than a thousand that have been carried out so far on TCGA data. As more such datasets become available, we expect to see—and to drive—a boom in discoveries of cancer markers that will advance our ability to treat cancer and improve outcomes for patients. For those who want to go further still, our proprietary DeepCODE AI tools offer a means of layering in even more datasets to drive insights even deeper into the biology of cancer and other diseases. And that’s a topic I’ll return to in the weeks ahead. 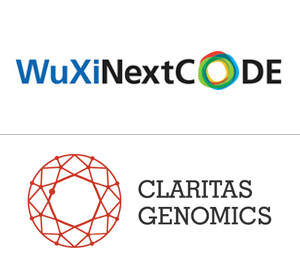 Claritas Genomics combines physician experience with next-generation sequencing and WuXi NextCODE’s analytics to accelerate rare disease diagnosis. It’s one of the most heartbreaking and frustrating things for parents and pediatricians. When a child presents with a constellation of symptoms that doesn’t point to a known disease, what do you do? Typically, these kids undergo a battery of tests, some of which will eventually be for single genes suspected to play a role in their health problems. But what if those tests come up negative? That leaves the families and doctors wringing their hands as they wonder what to do next. That was the case with a patient at Boston Children’s Hospital (BCH). He was a boy who, at six months, wasn’t sitting up, smiling, or doing most of the things babies his age typically do. Instead, he seemed “rigid” to his mom, and then he developed a severe respiratory virus and was hospitalized. He also had repeated seizures and eventually needed a tracheotomy—a tube placed through an incision in his throat to help him breath. Usually, such kids then begin going through what is known as a “diagnostic odyssey”—a long and arduous journey from doctor to doctor and lab to lab. BCH doctors are trying a new approach. In 2013, the hospital spun out Claritas Genomics, a specialized genetics diagnostics business that combines the experience of the hospital’s physicians with the power of next-generation sequencing and WuXi NextCODE’s advanced analytics. Timothy Yu, a neurologist and researcher at BCH, helped found Claritas to provide a more holistic approach to rare disease. WuXi NextCODE’s advanced analytics play a key role in improving the speed and efficiency of such diagnostics. Reading the genome isn’t the major challenge anymore—now the issue is finding the relevant mutations in those three billion base pairs. The data from a single genome can comprise more than 100 gigabytes, which is enough to fill the hard drive on a good laptop computer. Even the exome, which comprises the parts of the genome that encode proteins, can be 15 gigabytes. To diagnose a rare disease, doctors need to find sequence variations and then scour the research to find out what those actually do. That used to take months to years, and many of the variants were simply classified as being of “unknown significance,” without any further information or the ability to check again as the field of knowledge grew. WuXi NextCODE’s system has begun to make this a click-and-search task. Our knowledgebase can mine all publicly available global reference datasets simultaneously and in real time to show all there is to know about any given variant and its likely biological impact. By keeping the data in a WuXi NextCODE research database, such as the one BCH is growing every day, our system can also quickly rerun the analysis and provide new information as soon as it becomes known. Claritas is continually expanding the range of its services. Most recently, the group received conditional approval from the New York Department of Health for three new “region of interest assays” as well as one for mitochondrial DNA. That brings the number of Claritas’s approved tests in that state up to six and means more patients in New York will benefit from this new technology. Children at BCH with ambiguous diagnoses now regularly undergo a whole exome scan early in their clinical journey. The data is then triaged. It is examined first for the most obvious mutations and then more data is progressively analyzed as necessary. With the consent of parents and security measures for privacy, that data can also become part of research datasets at BCH and other major hospitals around the world, so that the growing data pool can benefit that child and others. This combination of expertise and technology helped Claritas Genomics find an answer for that baby boy and his family mentioned earlier. Heather Olson, the boy’s treating neurologist, had the boy’s exome scanned through Claritas Genomics, and 130 genetic variations were identified that could have caused one or more of the symptoms. WuXi NextCODE’s system helped narrow that down to only six variants that could have possibly been passed on by the boy’s parents. Olson and Yu finally focused on one, a mutation of the BRAT1 gene, which served as a diagnosis. A paper published by Yu, Olson, and colleagues, which describes this mutation and children affected by it, should help other physicians make this diagnosis more quickly in the future. Yu presented more on Claritas’s novel platform recently at Boston’s Bio-IT World meeting. He explained how the platform helps doctors to much more quickly and accurately diagnose kids with diseases not previously described. “Thanks to the speed of the platform, we can get a whole clinical exome completed in as little as two weeks,” he said. The growing database of genetic variants and their effects also means more patients will get an actual diagnosis, rather than walking away still wondering what could be going on. The ability to diagnose more cases is a start to unravelling the causes of the estimated 7,000 different rare diseases estimated to exist. And it’s a necessary first step towards developing new therapies for those conditions, too. A Yale research team, with contributions from WuXi NextCODE’s artificial intelligence (AI) and sequencing teams, has discovered a novel mechanism regulating how blood vessels grow. Artificial Intelligence (AI) can already catch a criminal and identify the right patients for certain types of surgery. But those challenges involve relatively few parameters compared to number of parameters or features involved in linking the 3 billion bases in the human genome with other ‘omics data and all the complexity of human biology. For that very reason, the promise of AI in genomics is as necessary as it is enticing, and WuXi NextCODE is committed to pushing the frontier of this emerging field. This week, I am encouraged by results from a study published in the latest edition of Nature, which describes how a well-known growth factor may play a previously unknown role in some important diseases. That report, led by Yale University scientist Michael Simons, investigates blood vessel growth regulation—a crucial process in some very common conditions, including cardiovascular disease and cancer. Our Shanghai team provided RNA sequencing for this study. Our Cambridge AI team applied some of the most advanced statistic in their toolset to take the data analysis to the next level. Simons’ team studied knock out mice, whose fibroblast growth factor (FGF) receptor genes were turned off. The scientists were able to prove, for the first time, that FGFs have a key role in blood vessel growth, uncovering some metabolic processes that were “a complete surprise,” according to scientists on the team. Further, they mapped out pathways that could help provide new drug leads. It’s inspiring to see scientists from around the world using top-notch technology to collaborate on pivotal research questions. This study involved scientists in six different countries. With the rapid rate of progress, it’s not surprising that AI is finding success in genomics. Today’s informatics capabilities allow for assimilating larger and larger datasets with AI applications, and the field is evolving at a rapid pace. Google alone published more than 200 papers on AI in 2016. Like us, they use a deep learning approach. Each AI problem has a different scale. In facial recognition, AI applications analyze relatively few features in the human face (about two dozen). Digital scans of the human eye that use AI techniques are able to segment patients before eye surgeries, and this entails algorithms that consider hundreds of features. Genomics, of course, involves looking at any number of feature sets among billions of possibilities. It’s an immense challenge, but I think it’s perfectly suited to AI. And with deep-learning tools, we can fish out many more insights than with traditional analyses. Our goal is to see how AI can help researchers achieve better results in identifying and evaluating new medicines, pinpointing risk factors and disease drivers, finding new combination therapies that work better than single drugs, and more. Our deepCODE tools comprise a novel, multinomial statistical-learning method and deep learning classification strategy. It’s an advanced approach to AI. This week’s Nature paper is another encouraging sign. Many of the stickiest problems in medicine are longstanding. 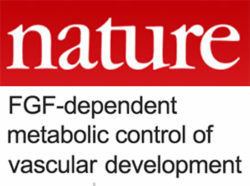 The role of FGFs in blood vessel development was poorly understood until now. This group’s findings may help open new avenues of research. Our team is always seeking to tackle problems with the latest approaches and technologies. Now, in the age of big data, it makes sense to start letting computers do more and more of the work, even some of the actual thinking. Certainly, we pick the questions and frame them. But then, let’s load the data and let the machines help us find the answers. If we can polish this process, and apply it to a growing number of problems, new answers and insights are sure to come. As leaders of our field gather in Vancouver for the annual American Society of Human Genetics Meeting (ASHG 2016), it is an excellent time to take stock of the past and clarify our perspectives for the future. For the field of genomics, this is an opportunity both to reflect on our accomplishments over the last few years and to consider what we can achieve in the years ahead. Indeed, our accomplishments have been numerous and our goals are ambitious, yet achievable. Here, I would like to summarize five significant ways in which our work in genomics has been revolutionizing medicine and improving patient outcomes. In addition, I would like to share my thoughts about five areas in which I believe our field can drive meaningful change over the next few years. The ever-increasing volume of genomic data is testimony to the dramatic increases in sequencing speed and efficiency over recent years. At the same time, novel methods of analysis, like the powerful genomics platform employed here at WuXi NextCODE, have considerably advanced our understanding of genetic variations and their clinical significance. As I have discussed here, the expanding use of genomic data to guide treatment decisions in oncology is transforming the way clinicians approach cancer treatment. In addition, our growing understanding of genetic predispositions for certain cancers is helping high-risk individuals make informed choices about preventive care. Genomic data has brought new hope to families struggling with rare diseases by shortening diagnostic odysseys, guiding treatment, and building communities. I provide examples of the game-changing power of genomics in the diagnosis of rare diseases here. Patients and consumers are increasingly informed about the innovative and meaningful ways in which genomic data can guide healthcare decisions. The successes in our field are empowering individuals to pursue personalized medicine and generating interest in direct-to-consumer testing. I offer my thoughts about DTC genetic testing here. The vast and ever-growing quantity of genomic data and related information necessitates new approaches to storage and analysis. As I have previously discussed, cloud-based computing is essential to continued success in genomics. WuXi NextCODE’s Exchange is at the forefront of the accelerated research made possible by real-time collaboration and analysis in the cloud. 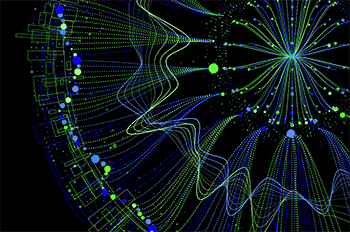 Realizing the full potential of big data and cloud-based computing will require new efforts to dismantle “data silos.” I am encouraged by recent initiatives to facilitate collaboration in cancer research, and – as I have recently discussed – call upon researchers and clinicians throughout the field of genomics to improve communication among all stakeholders. Our field derives its greatest power from careful analysis of genomic data, and access to data is critical to effecting meaningful change in healthcare. In order to gather this game-changing data – from patients, from consumers, and from population-wide studies – we need to develop and embrace policies that lead to consider the ‘biorights’ of patients. Individuals who wish to contribute information for research should have the opportunity to do so, and all parties should clearly communicate the purposes and extent of data-sharing. I perceive significant movement toward the development of clinical trials that test the efficacy of treatments tailored to specific genetic anomalies – and use genetic information to screen participants. This is an area in which genomics will dramatically accelerate the development of personalized therapies that will surely improve patient outcomes. I believe that in the near future we will reap significant rewards from projects that gather population-wide genomic information. Analysis of the data we are collecting around the world, which I describe here, is an essential step to reshaping healthcare practices worldwide. The power of genomic information is now known throughout the globe, and can be applied in a multitude of positive ways. With such widespread potential, individual countries and cultures will choose to advance and roll-out genomics in their own distinct ways for the benefit of their citizens. Companies that develop genomic products will need to adapt and design their products for use in specific markets. At WuXi NextCODE, the first focus of our product portfolio for individual patients and families is in China, where we are delivering three offerings: population-optimized diagnostics, carrier screening, and whole-genomic wellness scans. Together these initiatives build upon our recent accomplishments and further the creation of data and analysis necessary for meaningful change in healthcare. Enabled by collaborative work and effective communication. At WuXi NextCODE, we are energized by the prospects for genomics in the years to come. We are proud to be at the cutting edge, providing the tools and resources that researchers and clinicians need to harness the transformative power of genomic data. And—importantly—we are confident that our field will continue to drive meaningful changes in healthcare that improve patient outcomes. Around the world, researchers and clinicians are taking on the challenge of integrating genomic analysis into medical practice. Physicians and patients are increasingly aware of the potential utility of genomic data. As genomics continues to become a more powerful tool in healthcare, there is a clear and compelling need for a commitment to excellence in communication. Improve treatment choices, as I have discussed here. Maximizing the opportunities afforded by the ‘big data’ of genomics necessitates collaboration and communication, which I discuss in more detail here. As part of our genomics business, we are dedicated to the highest standards of communication – indeed, we view effective communication as central to how our technologies will improve health in both the near and the long term. As the recent CLARITY Undiagnosed competition highlighted, applying genomic data to medical practice involves interpreting the sequenced genomes and identifying molecular diagnoses – and a third step: communicating clinically useful results both to doctors and to patients. The CLARITY challenge winners, including WuXi NextCODE, were explicitly recognized for the quality and clinical utility of their reports. Guide their decisions if they are seeking treatment. Genomics is helping to inform patients in all these ways. In addition, genomics demonstrates enormous potential to empower individuals. The hundreds of thousands of people who purchase genomic testing through direct-to-consumer businesses like 23andMe are demonstrating a robust enthusiasm for gathering genomic information. And patients enrolled in clinical trials and donors participating in population-wide genomic studies express a desire to be more informed. Patients and consumers consistently seek resources that transform their personal genomic signatures into information they can use to make better healthcare and lifestyle decisions. And most patients and consumers are willing – often eager – to share their genomic information to aid medical research and discovery. 23andMe reports, for example, that 80% of its customers consent to share their genomes for research. It is unmistakably clear that, in the not-too-distant future, every individual in many countries around the world will have their genome sequenced. Throughout a person’s life, medical professionals will be able to access genomic information to guide health decisions – from identifying inherited conditions to assessing risk for complex diseases to calculating appropriate treatments, drugs, and even dosages for truly personalized healthcare. The more effectively we communicate – the more we share information within the research community and parlay that into clinically useful information for patients – the greater the benefit to all. As much as people understandably prefer simple, definitive answers to questions about their personal health, the information that genomics provides can be complex and even ambiguous. A genetic variant might be identified, for example, that can be tied to family medical history and translated into a probability or likelihood. This was the case for Angelina Jolie Pitt, who noted in her New York Times piece that her genomic analyses “gave [her] an estimated 87 percent risk of breast cancer and a 50 percent risk of ovarian cancer.” Percentage risks are nuanced, and individual perceptions of acceptable risk vary considerably. It is therefore difficult to define precisely the circumstances under which a genetic variant becomes clinically actionable. Or a genetic variant might be identified which gives physicians clues but does not explicitly identify a specific disease. For example, a patient seeking a diagnosis may have a genetic variant that correlates to a number of diseases involving dysregulation of lipid metabolism. Identifying the variant provides physicians and caregivers with a clear direction for further analysis and treatment, but does not yield a conclusive diagnosis or prognosis. Or a genetic variant might be identified which has yet to be understood as causing or playing a role in disease. Such a variant may occur by chance and have no medical relevance, or its meaning may be uncovered as science in the field advances. But for the person who is having the genomic information analyzed today, it offers no actionable information. As all of these examples illustrate, effective communication about genomic information can be a significant challenge. There is a risk that poor communication will be a barrier to the adoption of genomic medicine, but if we strive to communicate clearly with patients and the public, our successes will likely accelerate more widespread use of genomics. The role of genomics in transforming health care will grow exponentially as we all endeavor to improve communication with patients, their families, and the public at large. Our work at WuXi NextCODE is advancing the transformation of medical practice through genomics. As part of that vision, we recognize the critical importance of facilitating effective communication among all stakeholders. We provide the resources that enable researchers and clinicians to identify disease and inform treatment decisions. And we strive to add additional value by communicating about genomic information accurately and proactively, all with the ultimate goal of meaningfully improving patient outcomes. The big data of genomics will continue to expand, and our approaches to analyzing genomic data need to continue to evolve to meet the growing demands of clinicians and researchers. 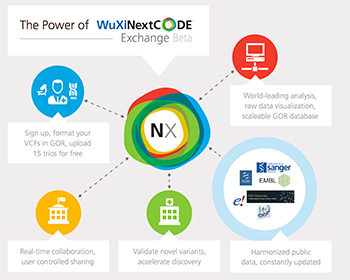 Cloud-based platforms such as WuXi NextCODE’s Exchange are essential to address the fundamental big data challenge of genomics. Beyond question, we are in the midst of an explosion of “Big Data” in many facets of human endeavors. In fact, data-storage leader IBM asserts that roughly 2.5 quintillion bytes of data are generated every day and 90% of the world’s data was created in the last two years. An outpouring of articles in scientific journals and major newspapers has highlighted the promising potential of big data in medicine, including a special section in the current issue of Nature. Genomics has become a major source of the growth of such big data, particularly as the cost of sequencing genomes has plummeted. The raw sequence data for just one person’s whole genome use as much as 100GB—and already hundreds of thousands of individual genomes have been sequenced. With more than 2,500 high-throughput sequencing instruments currently used in 55 countries across the globe, more genomes are added every day. The aggregate amount of genomic data is growing explosively, and next-generation sequencing (NGS) sequencing data are estimated to have doubled in volume annually since 2007. The accumulation of genomic data is a worldwide phenomenon. Impressive population-wide sequencing efforts are leading the way, from 100,000 genomes in England, Saudi Arabia, and Iceland to 350,000 in Qatar to a million in both China and the U.S.
And earlier this month, the CEO of the Cleveland Clinic predicted that soon children will routinely have their whole genomes sequenced at birth, implying a near-future in which 10s of millions of new genomes are sequenced annually. But sequencing genomes is not enough, and the creation of genomic big data is just the beginning. Thanks to the analysis of big data in genomics and associated informatics, we are seeing meaningful progress in cancer care and the diagnosis of rare diseases, as I have discussed here and here. We clearly have a tremendous opportunity to use the big data of genomics to continue to drive a revolution in healthcare. The power of genomic analysis needs to expand outward from major research centers and hospitals to the myriad clinics and community hospitals where many patients receive care. 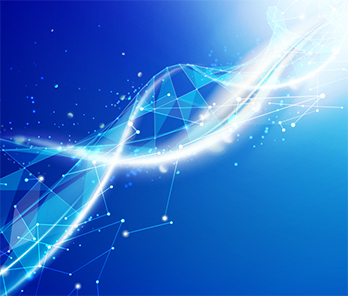 To have the greatest impact on the broadest population, clinicians throughout the world’s health systems need access to the big data generated by DNA sequencing, even—or perhaps especially—if they are not affiliated with research institutions. They also need to be able to make sense of the data they have access to. Sequencing provides the raw data to uncover the genetic variants that contribute to disease. But the datasets are too big to transfer repeatedly—and too big even for smaller hospitals, labs, or clinics to store onsite. Key medical advancements require not only big data, but also tools and resources to generate, interpret, and share analysis of millions of genomes. Cloud-based platforms—such as WuXi NextCODE’s Exchange—are essential to address the fundamental big data challenge of genomics. Collaboration in the cloud works to dismantle existing “data silos”—genomic information hosted only on local servers and analyzed on idiosyncratic, closed platforms. The NextCODE Exchange, in contrast, is a browser-based hub that affords secure, seamless collaboration with colleagues around the world. Moreover, users get access to NextCODE’s tools for making the critical links between variation in the genome and disease and other phenotypes, backed by harmonized links to the the most important public reference data. And cloud-based computing is inherently scalable: resources for data storage and analysis expand as needed, allowing researchers and physicians to leverage massive datasets to improve patient care in the clinic. The big data of genomics will continue to expand, and our approaches to analyzing genomic data need to continue to evolve to meet the growing demands of clinicians and researchers. At WuXi NextCODE, we have built upon our heritage of conducting the largest analysis of genomic data (deCODE’s path-breaking Icelandic analysis) by assembling an ever-growing database of human genomes. We are committed to driving the movement of sequence data into patient diagnosis and care through user-friendly, leading-edge analysis and informatics. I am confident that data analysis and collaboration in the cloud will revolutionize healthcare, and exceptionally proud that WuXi NextCODE’s Exchange is at the forefront of this exciting advancement.